Teach math skills (fractions or repeated addition) and enjoy yummy food with your kiddos. 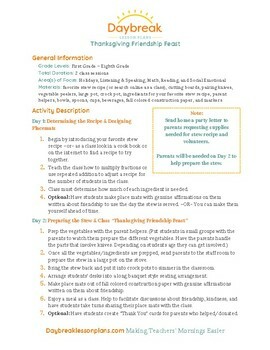 To get the feast going, you will need a favorite stew recipe (or search online as a class), cutting boards, pairing knives, vegetable peelers, large pot, crock pot, ingredients for your favorite stew recipe. Most importantly recruit some parent helpers to help with the prep and good time messiness. Paper products needed: bowls, spoons, cups, beverages, fall colored construction paper, and markers. From the Daybreak Teachers Team, have a wonderful Thanksgiving with family and friends.